The image of a comfortable hammock strung between a pair of trees is a classic of backyard leisure, but unfortunately not every yard has a pair of conveniently placed trees. One way around this problem is to set one or two posts to use as anchors in place of the more traditional trees. The procedure for installing a hammock post is very similar to that used for setting fence posts and involves no specialized skills. One way to hang a hammock is from posts. Dig a post hole with the post-hole digger and shovel. The dimensions of a basic hammock post hole are twice the width of the post and 24 inches deep. If the ground is sandy or otherwise unreliable, make the post hole depth 30 inches. Fill the bottom of the post hole with 6 inches of gravel if you dug a 30-inch-deep hole because the ground is sandy or otherwise unstable. If you have solid ground and dug a 24-inch-deep hole, skip this step. Mark a spot on the post's center line and near the top of the post, and drill a hole into that mark using a drill bit one size smaller than your screw hook. The exact placement of the drill hole depends on the size of your hammock and how far above the ground you want it to hang. For a short post, you might want to put the drill hole only 1 inch from the top of the post, while the hole might be 6 inches from the top for a taller post. Drive the hook screw into the post by turning it by hand. Place the post into the post hole, with the hook facing the desired direction for hanging the hammock. Set the post into a plumb (vertically straight) position by setting a carpenter's level on the top or side and adjusting its placement. Mix a batch of quick-setting concrete in a bucket and pour it into the post hole, while an assistant holds the post steady. Fill the post hole with concrete to a point about 2 or 3 inches from the top. Hold the post in place for 10 to 20 minutes while the concrete hardens. Install a second post, if necessary. 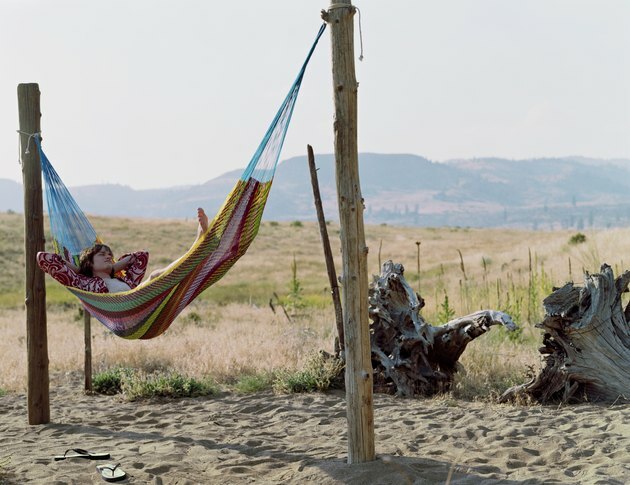 Add 24 inches to the length of your hammock to determine how far your second post must be installed from the first. Wait overnight and cover the remainder of the post hole(s) with dirt and sod.